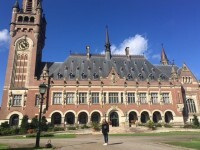 This summer Georgia Antonopoulou (ERC PhD candidate) and Priskila Penasthika attended the Hague Academy courses on Private International Law. Expanding over three weeks, the summer courses consisted of lectures given by ‘great’ names of public and private international law. While Prof. Ruth Okediji from Harvard Law School captivatingly lectured on the international aspects of intellectual property law, Prof. Marc-Philippe Weller from Heidelberg University unraveled the ‘tripartite’ method of international private law. In addition, during the PhD meetings, Georgia and Priskila introduced their research to fellow participants and exchanged ideas on their topics. Last but not least, Georgia and Priskila enjoyed the international environment of the summer courses where students, legal practitioners and academics from more than 100 countries gathered under the roof of the historic Peace Palace.